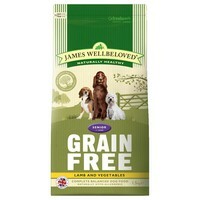 James Wellbeloved Senior Dog Grain Free (Lamb and Vegetables) is a complete dry, hypoallergenic food for older dogs over 7 years of age. Made with natural ingredients with added vitamins and minerals, the dietetic food contains selected protein source lamb and selected carbohydrate sources of pea and potato which are excellent for the reduction of ingredient and nutrient intolerances. Potato Flakes (28.1%), Lamb Meal (23.0%), Pea Starch (22.6%), Tomato Pomace (5.0%),Whole Linseed, Lamb Fat (3.0%), Lamb Gravy (2.9%), Peas (2.5%), Pea Protein, Sugar Beet Pulp, Alfalfa Meal, Omega Oil Supplement*, Carrots, Seaweed (0.5%),Pea Fibre, Potassium Chloride, Sodium Chloride, Parsley (0.125%),Nettles (0.125%), Chicory Extract (0.1%), Taurine (0.1%), Calcium Carbonate, Glucosamine (0.045%),Yucca Extract (0.02%), Chondroitin (0.005%).